It’s pretty straight forward… :-P However, just a tip… some of the examples have a lot of white space around them. I recommend cutting most of the white space out so it doesn’t look too empty. Maybe back them with construction paper or something. 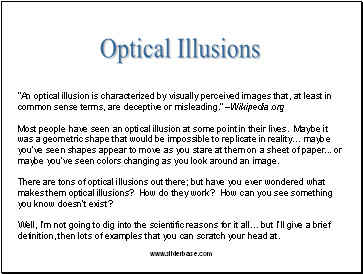 Most people have seen an optical illusion at some point in their lives. Maybe it was a geometric shape that would be impossible to replicate in reality… maybe you’ve seen shapes appear to move as you stare at them on a sheet of paper . or maybe you’ve seen colors changing as you look around an image. 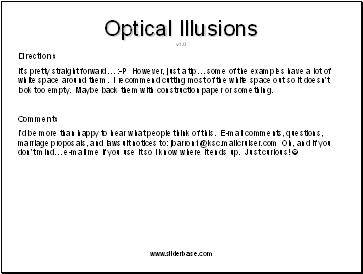 There are tons of optical illusions out there; but have you ever wondered what makes them optical illusions? How do they work? How can you see something you know doesn’t exist? Well, I’m not going to dig into the scientific reasons for it all… but I’ll give a brief definition, then lots of examples that you can scratch your head at. 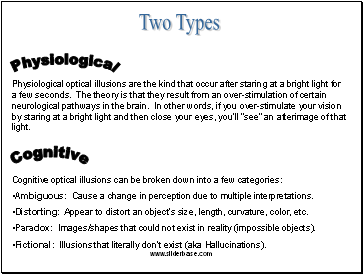 Physiological optical illusions are the kind that occur after staring at a bright light for a few seconds. The theory is that they result from an over-stimulation of certain neurological pathways in the brain. In other words, if you over-stimulate your vision by staring at a bright light and then close your eyes, you’ll “see” an afterimage of that light. Ambiguous: Cause a change in perception due to multiple interpretations. Distorting: Appear to distort an object’s size, length, curvature, color, etc. Paradox: Images/shapes that could not exist in reality (impossible objects). Fictional: Illusions that literally don’t exist (aka Hallucinations). 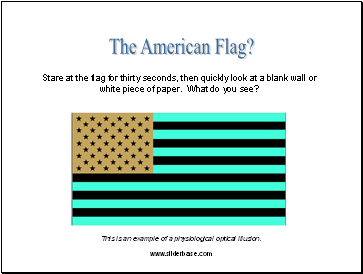 Stare at the flag for thirty seconds, then quickly look at a blank wall or white piece of paper. What do you see? This is an example of a physiological optical illusion. 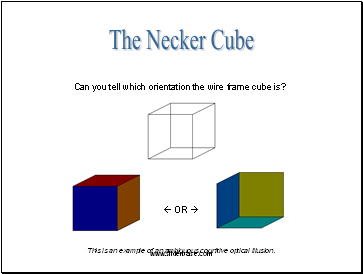 Can you tell which orientation the wire frame cube is?